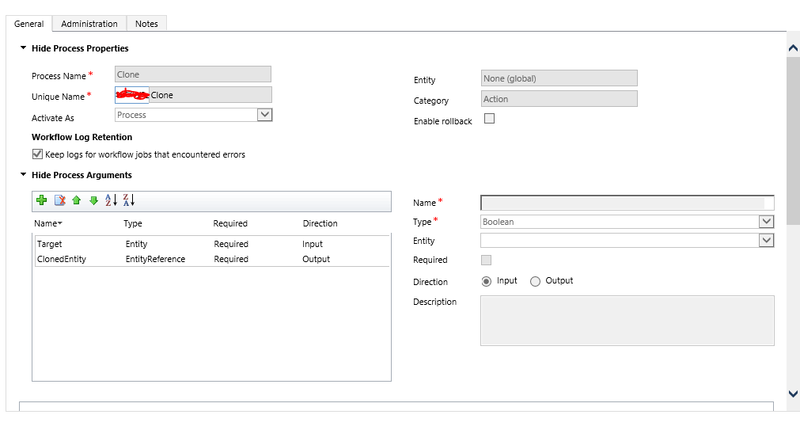 – Button inserted on Entity record, set up to only display for an existing record, IE not on the Create form. The button calls the cloneRecord() function, which will be detailed later. – Plugin written which is registered on the Clone event (the one we created above) of any entity. The plugin is pretty simple, basically looping through all the attributes of the Target entity being fed to the Clone action and creating a new entity with the same values. It then passes an EntityReference back to the OutputParameter. Code below. The cloneRecord() function creates an Execute request with an Entity key value pair being passed called “Target”. I am using XrmServiceToolkit (which I really like, link) to perform the request. I then take the response and parse out the guid and logicalname of the returned EntityReference. I found that I had to use the .children() function in jQuery to properly parse out the value, I couldn’t get .find() to work, and I’m not sure why… Anyway, I then use Xrm.Utility to open the newly created record. The nice thing about this code is it is Entity agnostic, you don’t have to write a new function for each entity type. I had to change the code for the currency type to – ‘outputEntity.Attributes[key] = new Money(inputEntity.GetAttributeValue(key).Value);’ Before this, currency fields were not copying over. Having a few problems trying to replicate this, the soap request is success get a 200 however, my plugin doesnt seem to fire. Plugin is registered on Clone event execution mode synchronous,.